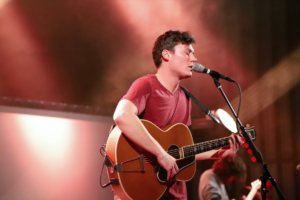 New Jersey indie rock band The Front Bottoms made a stop at College Street Music Hall on Friday, Oct. 20. They were on tour in support of their new album “Going Grey,” the group’s fourth studio album. They were accompanied on this tour by English rock band Basement and fellow minnesota indie rock band Bad Bad Hats. Bad Bad Hats kicked off the show and while the balance and overall blend between the bass and vocals was off, they grabbed a hold of the energy in the room and helped it grow. All around people were bopping their heads to their songs. Lead singer Kerry Alexander had great stage presence which helped elevate the already existing excitement in the air. Up next came Basement, coming off the release of its 2016 album “Promise Everything.” This is where the crowd really got going, as mosh pits started opening up in the middle of the pit. They played several of their new songs including “Promise Everything” and “Aquasun” which had fans singing along as they threw themselves into one another. Basement also had some difficulties with its balance as the vocals were a little lower than the rest of the band. Their performance was fueled by the crowd’s energy. Basement ended with a healthy applause. Now, it was time for The Front Bottoms. The Front Bottoms started off the show playing the first track off of “Going Grey,” “You Used To Say (Holy F***),” which was accompanied by the crowd filling in as lead singer Brian Sella would step away from the mic allowing, for the song to become a duet with the crowd. This was a common theme as Sella would routinely step back and let the audience take charge over a chorus. Always talking to and engaging with the crowd, Sella even heard a fan yell a request for the song “Father” and added it into their encore. The set lasted 18 songs, and they came out for a three-song encore. The band’s musicality was highlighted by how they didn’t sound like they did on their record; they sounded better. They didn’t go up there and perform pitch for pitch, phrase for phrase what they had recorded on each of their studio releases. They went up there and were musicians. The band’s balance was near perfect, which was impressive considering the assortment of instruments. Aside from your standard guitars, bass and drums, there was use of a multi-neck guitar, keys, a keytar, a violin, cello and trumpet. There were even two different sized cowbells, the smaller had a higher pitch, and the bigger a lower pitch. There were many instances during the show where Sella would sing parts of songs in different octaves than what was recorded on the album, or he would sing melodies in slightly different rhythms. They also added a tom-tom introduction to the finale of the set, their popular tune “Twin Size Mattress.” The Front Bottoms took their music “off the page” and really let their musicality take over. The crowd was wild and heavily engaged from the get-go. Despite some controversy over their new album having a bit of a different sound than their previous releases, the band’s setlist reflected songs from all of their studio releases. This included four songs from “The Front Bottoms,” “Talon Of The Hawk,” and “Back On Top,” respectively. Their stage had two levels and screens that they used to display music videos for some of their songs. The lighting complemented the timbre, or tone color, of each song well, and they had a backdrop which was an extended image of the “Going Grey” album cover which features a man and a woman, which fell after their first song to reveal their “TFB” logo. The show cost between $23.50 and $35 and was definitely worth the price. When you have a show, and especially a headlining act that engages with the crowd the way that The Front Bottoms did and that displayed their musical abilities as well as they did, it’s hard to beat. If you’re ever asked to go see The Front Bottoms, your answer should be a capital Y-E-S as this concert gets a strong 4.8/5 stars, and one twin size mattress.